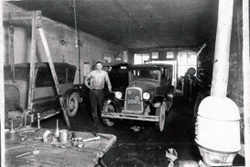 Back in 1939, George H. Parmentier took a giant step and began his auto body shop at the corner of 4th & Oak Streets in Washington. Through WWII, years when parts were very hard to get, sheet metal repair was a skill that had to be learned. A few years after the war George's son Herb began his career in the body shop. Herb's father taught the skills of auto body repair to him. Herb remained a vital part of his business for more than 50 years. Herb's younger brother Clarence has continued the tradition of doing quality repairs to this day. The skills of their father were handed down to his sons. When George retired, Herb and Clarence continued to see the shop grow. Our shop moved two times throughout the years in order to continue to give our customers the quality work and customer service they deserve. In the early 1990's, George A. Parmentier joined the business, as did Clarence's daughter Theresa. Clarence's wife Carol ran the office for many years until Theresa took over. 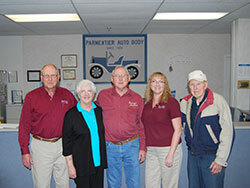 Three generations of the Parmentier family have run the business, which continues today at our modern facility off of Hwy 100 West in Washington, Missouri. We perform complete auto body repairs and work with all makes and models. And we don't just stop there. We believe in preserving our future, which is why our collision center uses environmentally friendly products, including high performance waterborne automotive refinish coatings from DeBeer, a brand of Valspar Automotive Finishes. Our family business has been operated by three generations of Parmentiers, and we continuously educate ourselves on the newest equipment and repair techniques to give each customer a professional auto body repair experience they won't find anywhere else. Give us a call or stop in today, and let us help get your vehicle back on the road!